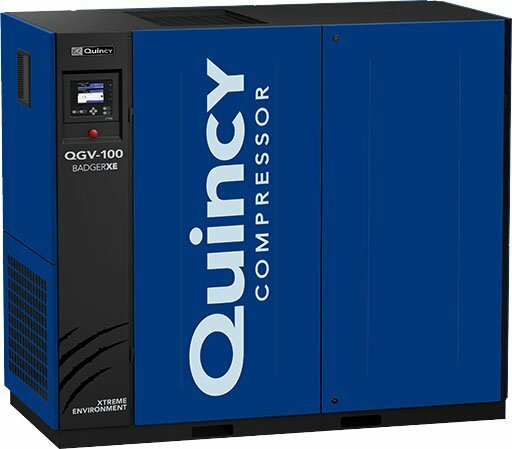 Quincy variable speed compressor QGV®️ is a rotary screw air compressor that provides a stable pressures with 85% turndown. The QGV®️ variable speed compressors is a direct-drive airend with 100,000 hour design, providing low cost of ownership, easy maintenance and reliable operation. A variable speed air compressor is equipped with a specially designed drive that controls and adjusts the operating speed. This offers a number of benefits, including delivering more constant pressure, protecting against power surges and lowering energy consumption. Many variable speed air compressor owners experience a significant reduction in their energy costs over time. The Quincy QGV®️ variable speed rotary screw air compressor provides among the most stable of pressures available from a compressor with 85% turndown. At the heart of all QGV®️ compressors is a direct-drive airend with 100,000 hour design, providing low cost of ownership, easy maintenance and reliable operation. Enjoy real-time performance monitoring with graphical analysis and full-color, touch-screen control. A highlight of QGV®️ air compressors for variable speed use is the highly efficient low demand mode, which performs the valuable function of preventing rapid cycling during intermittent periods of low compressed air demand. This low demand mode permits the pressure to rise above a predetermined point prior to stopping the unit when demand falls below turndown capacity. In addition to ensuring the compressor never operates unloaded, this feature also prevents the pressure dropping below an acceptable level. For multiple networked compressors, this mode allows the pressure to rise to a level at which the additional pressures will automatically shut down during periods of low demand. The “brains” of the QGV®️ variable speed rotary screw air compressor is the microprocessor controller, which features a 6” color touchscreen display and interface. The controller enables continuous monitoring of all facets of compressor operation. The controller includes intuitive software that that automatically tracks all essential operating parameters and produces and delivers pertinent data to the user for real-time monitoring. Another unique feature of the QGV®️ speed compressor is the speed optimizer control, which is capable of automatically adjusting the unit’s speed output to account for changes in the surrounding operating environment. This enables maximum air flow delivery without impacting the compressor’s dependable performance. The QGV®️ air compressor used for variable speed is less expensive to own than comparable units on the market. The highly efficient airend design will significantly reduce your energy costs, and with a bearing life that’s up to three times that of competing models, you’re assured of reliable performance and lower maintenance costs. We’re so confident in the quality, performance and reliability of the QGV®️ that we back it with our Royal Blue Warranty. This industry-best warranty provides 10 years of coverage for the airend and five years for other major compressor components including the drive assembly, cooler, motor and reservoir. Best of all, this coverage is available for all QGV®️ models at no extra cost. Owners simply register upon startup, sample fluid accordingly and use only Quincy Genuine parts for maintenance.